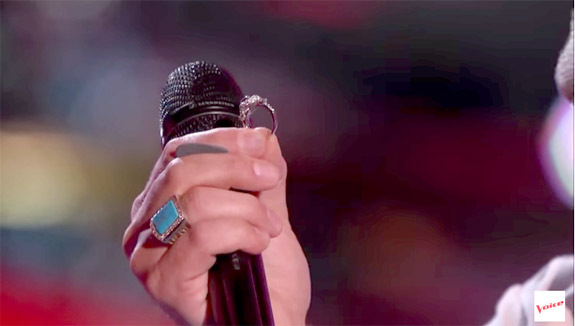 Jubal Lee Young wrote a new chapter in the annals of NBC’s hit show The Voice when he popped the question to his singing partner Amanda Preslar just after their blind audition on Monday night’s episode. 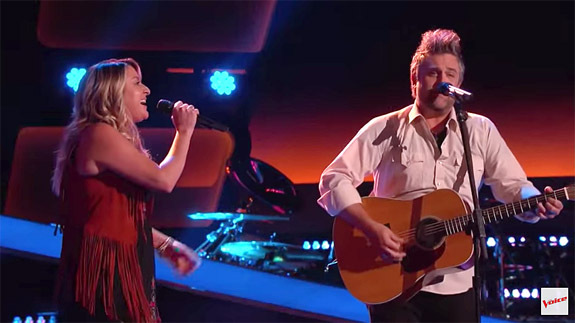 Young and Preslar had just completed an original rendition of “Seven Bridges Road” by The Eagles when judge Gwen Stefani noted that their seductive harmonies conveyed an unusual chemistry. Then, judge Blake Shelton asked asked a more pointed question about their relationship: “Are you guys a couple?” he inquired. “Are you married?” Shelton probed a bit further. 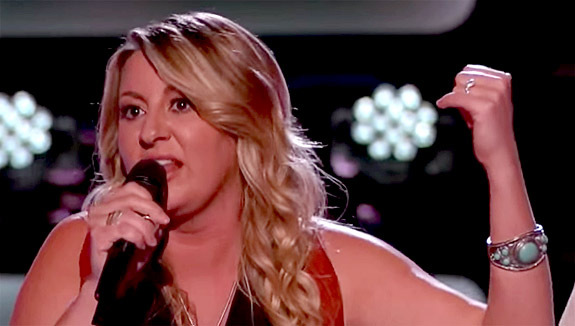 She quickly realized that this on-stage proposal was for real. “I love you,” she said. “I love you. Will you marry me?” Young whispered in her ear. A stunned Shelton could hardly believe what was going down. “What just happened?” he asked. “Are you serious?” Stefani gasped. Then Young gently placed the ring on his girlfriend’s finger. 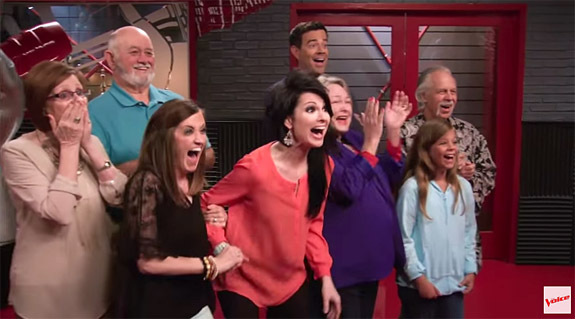 Almost as much fun as watching the surprise proposal was seeing the spontaneous, delirious outpouring of emotion from the couple’s loved one’s backstage. 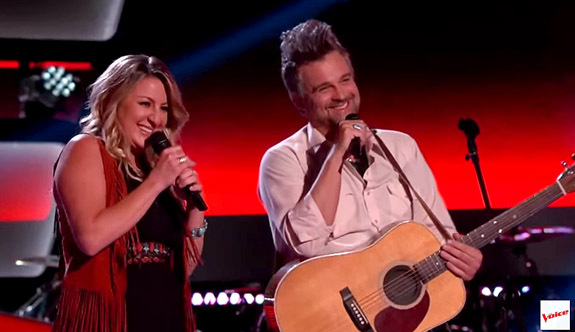 The couple’s blind audition impressed both Stefani and Pharrell Williams, who turned their chairs, signifying their interest in coaching the singers in the subsequent rounds of the music competition show. The couple chose to go with Williams. 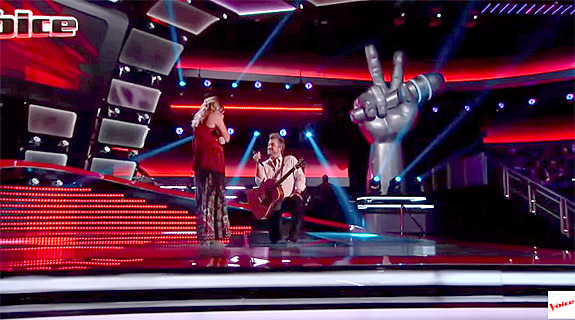 The couple’s momentous performance/marriage proposal can be seen in the video below. The song “Seven Bridges Road” is close to Young’s heart because it was written in 1980 for The Eagles by his dad, Steve.